← Yet it Was I! I can’t help but think of Stephen in his standoff with his accusers when I read Hebrews 3:12-15. When I think of holding “fast the beginning of our assurance until the end,” the illustration on the page is him, gazing upwards as the stones flew. While his captors gnashed their teeth, he had the countenance of an angel. While they breathed lies, he spoke the truth with clarity. While they rushed to judgment, he compassionately pleaded for God to be merciful. 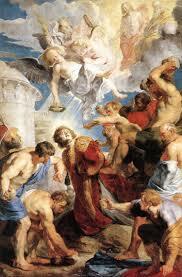 Stephen’s heart from the very beginning of his spiritual life had been full of the Spirit, power and grace. The much he apparently knew about God before salvation was united in faith at it, and then magnificently manifested in service. His enemies were the ones talked about here, those with hardened hearts, deceived by sin, provoking and attacking God and his messengers at every turn. These same men killed Jesus, “the exact representation” of God (Heb. 1:3), the one whose spirit now radiated through Stephen like the sun. This tragic repeat of history unfolding with the killing of yet another “prophet” was mightily used to spread the Gospel beyond Jerusalem (Acts 8:1), and to provide us a model of a true believer. What we’re up against may not rear its ugly head in the outward persecution of the saints as Paul viciously did, at whose feet were Stephen’s clothes, but a hardened heart will nonetheless invoke condemnation. But as Paul later wrote, there is now no condemnation for those in Christ Jesus (Rom. 8:1). The blinding light that so radiated from the convictions and courage of Stephen, holding firm until the end, shone on him soon (Acts 9:3), and we know the rest of the story. So important it is to stand firm through thick and thin! You never know who’s watching! There is much intellectual debate among evangelicals on how high the bar is to be saved. Is he or isn’t he? Well, Stephen’s example gives us a good composite sketch of who is. When you see a man or woman exhibiting courage under fire, showing convictions when challenged, extending compassion when moved, giving a clear reason for the hope that lies within them, i.e. Jesus Christ (1 Peter 3:15), and an inexplicable countenance while doing so, they probably are! This entry was posted in Commentary, Devotionals, Hebrews and tagged Acts 7:58-60, assurance, courage, faith, Hebrews 3:12-15, Paul, Stephen, stoned, stoning. Bookmark the permalink.